Prestigious British cruising yacht manufacturer Oyster Yachts is gearing-up for a banner year in 2018, with exciting special projects and new models. Project Alpha, a 33.5 metre (110 foot), design by Reichel Pugh is a slippery performance version Oyster which would be constructed in carbon fibre. If commissioned she may well be the fastest big yacht the well-respected yard has ever turned-out. Oyster Yachts CEO David Tydeman told Ocean about the project, which would be built at its Southampton, UK facility. He said the Reichel-Pugh design studio known for creating the lines for the world fastest grand prix supermaxis – Wild Oats XI and Black Jack – have come-up with a stunning design for an existing Oyster owner. Project Alpha will accommodate eight guests in four cabins with ensuites, with a full-beam master suite in the bow and space for six crew members. Project Alpha – a slippery performance version 33.5-metre Oyster constructed in carbon fibre. This image shows the wedge deck option. 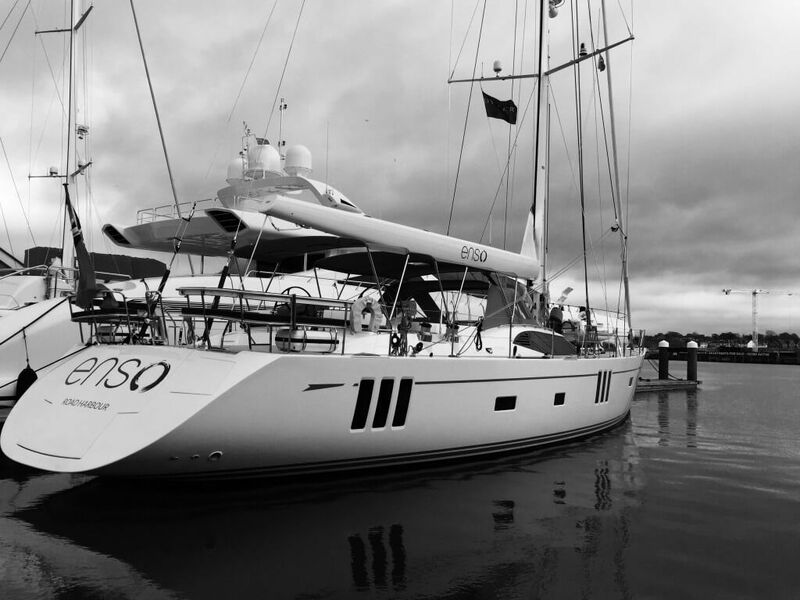 Enso, an Oyster 825, will be at the Millennium Cup in January. “Within the Oyster Group, we have always had the appetite for special projects to complement the activity building our standard yachts,” Tydeman continued. “Over the years we have completed many refit and restoration projects on lighter-weight, carbon yachts, including making four custom carbon tenders for a Russian superyacht owner, and so it has been very exciting to respond to the request from two existing Oyster owners (of standard yachts) to look at building them faster, lighter carbon regatta yachts. years ago with the Melges 24 class and it has been a treat to work with him again on “Project Alpha”. The innovative design project is the latest shake-up in Oyster offerings, with the complete revision of the standard range over the past few years and the recent announcement of the new Oyster 835 and 895, which now complete a family of seven yachts from 17 to 36 metres. The company revealed in September plans for the two big volume, refined and technologically tweaked models. Designed to replace the successful Oyster 825 and 885 – the 835 and 895 include features from the development of both the larger Oyster 118 (2 sold) and the smaller models – the Oyster 475, 565, 575, 595, 675, and 745. Across the range, Oyster currently have 23 yachts in various stages of production. The first 118 superyacht is nearing completion and should be handed to its appreciative owner by May 2018. But there’s strong interest across the entire Oyster range, with around $140 million in orders on the books. Oyster’s reputation for blue water luxury passage makers with rock solid engineering has seen the brand move confidently into larger model sizes, which were once the domain of custom yards. Examples of this are the 745, 835 and 895 which are built for comfortable world cruising. The two bigger boats boast interior layout options for three or four owner and guest cabins sleeping up to 8 on-board in great luxury, supported by ‘Silver Service’ facilities for two, three or four crew. The popularity of this size of vessel, effectively a pocket superyacht, is evidenced by the four orders already in hand for boats in the 80-90 foot category. The group’s five-year plan is focused on no fewer than seven new models between 56 and 118 feet, complemented by an increasing amount of custom new builds and restoration work.